Watch what President Trump does, not what he says: That’s become a familiar mantra from Congressional Republicans during the administration’s first few weeks in office. But it’s also critical advice for investors attempting to pick the beneficiaries of the Trump administration’s policies—not an easy task by any means. Take the energy sector. Trump has been steadfast in his promise to resurrect the coal industry and has expressed skepticism about human responsibility for climate change as well as the benefits of renewable energy. But since election day, shares of Peabody Energy Corp (OTC: BTUUQ)—the largest US coal producer by revenue—have collapsed by almost 70 percent. Meanwhile, the Guggenheim Solar Index (NYSE: TAN) has gained more than 10 percent, and shares of Vestas Wind Systems (Copenhagen: VWS, OTC: VWSYF), the world’s largest pure-play manufacturer of wind turbines, have rallied by about 20 percent. Consider the appointment of Rick Perry, the former governor of Texas, as secretary of the US Dept of Energy. As a candidate for president from an oil- and gas-rich state, Perry famously promised to abolish the Dept of Energy. Yet during his tenure, Texas became the country’s largest wind-power producer, with this renewable resource accounting for more than 10 percent of the state’s generation mix. Will the next four years end up being bullish for renewable energy and bearish for coal? Next week’s Energy Innovation Summit, sponsored by the Dept of Energy’s Advanced Research Projects-Energy (ARPA-E), will provide our first insight into what’s to come. ARPA-E is modeled after DARPA, the Defense Advanced Research Projects Agency, and its four-day conference provides a forum for developers of hundreds of energy-related technologies to meet up with venture capitalists and other investors. No matter how promising, many of these technologies won’t become marketable products. And even if the developers secure funding, scaling up may prove economically impossible. A competitor may invent a cheaper or better alternative, regulatory policies could change or consumer preferences may shift. The few innovations that ultimately survive and come to market amount to a winning lottery ticket for their developers and investors. The opportunity to stay abreast of emerging technologies and assess their implications for the utility and energy sectors has kept me coming back to ARPA-E’s Energy Innovation Summit for several years. These insights help to inform my stock selections for the three model portfolios in Conrad’s Utility Investor and the Buy, Hold and Sell ratings for the more than 200 essential-service companies tracked in the publication’s Utility Report Card. At last year’s conference, energy storage emerged as a major focus in the exhibition hall and the panel discussions that took place. 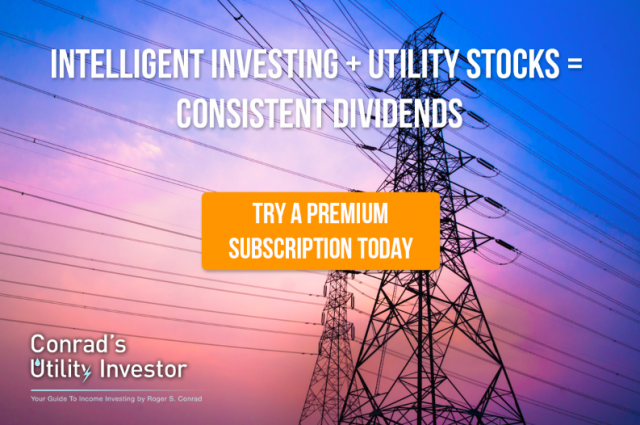 My exclusive follow-up report for Conrad’s Utility Investor subscribers highlighted AES Corp (NYSE: AES) and AGL Energy (ASX: AGL, OTC: AGLNY) as high-quality utility franchises that pay generous dividends and have emerged as leaders in the development of grid-level storage infrastructure. Since we published our key takeaways and best ideas from last year’s Energy Innovation Summit, AES Corp’s stock has gained 13 percent, while AGL Energy’s shares have generated a 41 percent return in US dollar terms. Over the same period, the Dow Jones Utility Average posted a total return of 10 percent. Although the sponsors and presenters at this year’s event committed to attend long before Donald Trump won the 2016 presidential election, my conversations with presenters and other attendees will provide on-the-ground intelligence regarding the new administration’s priorities and their implications for energy innovation. Here are some of the points of interest on our minds as the conference approaches. How much prominence will fossil fuel-related technologies have at ARPA-E’s summit? We also wonder about the extent to which these innovations will focus on controlling drilling costs to enable oil and gas producers to compete in an environment where energy prices remain lower for longer. Water supply and disposal remain cost centers for producers unlocking oil- and gas-bearing shale formations with hydraulic fracturing, while injecting flow-back into underground disposal wells has been linked to an increase in the frequency and intensity of earthquakes in Oklahoma. Water-recycling technologies could help to cut costs and reduce oil and gas producers’ legal, regulatory and reputational risk. Industry insiders we talked to at the DUG Midcontinent Conference in 2016—see our key takeaways and best investment ideas from this event—indicated that reducing water-related costs and liabilities were a priority. Under President Obama, the US Dept of Defense sought to improve the military’s energy efficiency and reduce its dependence on fossil fuels as a way to cut costs and reduce logistical complications. Jim Mattis, President Trump’s secretary of defense, reportedly shares these concerns. In recent years, Southern Company (NYSE: SO) and other utilities have built a growing business ramping up solar-power capacity at military bases. A shift away from this strategy wouldn’t jeopardize existing contracts, but this opportunity set could shrink. Perhaps the Dept of Defense-sponsored breakfast at ARPA-E will provide clues as to future policy. At last year’s energy innovation summit, several speakers asserted that energy-storage solutions would be uneconomic for most grid-related applications well into the next decade. But AES Corp, AltaGas (TSX: ALA, OTC: ATGFF) and other companies covered in our Utility Report Card have completed energy-storage facilities that already contribute to earnings. Just before Chairman Norman Bay stepped down from the Federal Energy Regulatory Commission (FERC), the agency mandated that the Midcontinent Independent System Operator (MISO) overhaul market rules to accommodate more energy storage. With only two seats on the five-member commission filled, FERC lacks a quorum to make further decisions. But this ruling is now MISO’s mandate—a major plus for energy-storage developers. What will happen when President Trump appoints three commissioners—two Republicans and one Democrat? ARPA-E’s Energy Innovation Summit could provide valuable clues about potential changes to FERC policy. I’ll pay particular attention to comments from Sen. Cory Gardner, R-C.O., and a to-be-announced official from the Trump administration. The ARPA-E Energy Innovation Summit takes place from Feb. 26 to March 2. Conrad’s Utility Investor subscribers will receive access to my full video presentation and slides on Monday, March 6. Not a Conrad’s Utility Investor subscriber? You couldn’t pick a better time to sign up for a risk-free membership. Not only will you receive access to my exclusive report and best investment ideas from the ARPA-E Energy Innovation Summit, but you’ll also be able to attend my next quarterly online chat—your opportunity to ask me anything related to investing and the companies I cover. These marathon sessions can last for five or six hours—a transcript is available for those who don’t have that kind of time—and I don’t sign off until I’ve answered every question. Activate your 30-day, risk-free trial now! Still on the fence about signing up? Download a sample issue of Conrad’s Utility Investor to see what you’re missing.